SendLater is free e-mail scheduler software allowing you to handle your email correspondence in a timely manner. Your computer will never forget to send an important business or personal message. Prepare all your email notifications and reminders, greetings in advance and schedule their delivery. Each time you reply or create a new e-mail message, you will be able to choose a particular time for your PC to send your message. Just click the "SendLater" icon on the toolbar and select the sending time using time-and-date selector. Click "Send later" and your message will be scheduled for that time and saved in the "Send Later" folder. 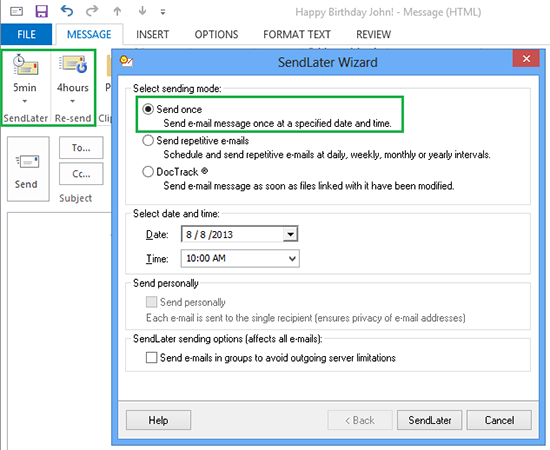 And at any time, you can open the "Send Later" folder and edit, remove or send your messages manually. Re-send email in case it was not responded and send repetitive emails until the response is received. Use SendLater Pro Edition to set up repetitive emails at comprehensive time intervals. Attach documents to the scheduled delayed e-mail with DocTrack feature. As long as your computer is online, your e-mail will be sent automatically even Outlook is not running. SendLater Pro Edition features: - Repeat your email until a response is received; - Re-send email in case it was not responded; - Send delayed or repetitive emails even if your Outlook is not running; - Attach documents to the scheduled delayed email; - Link a file or folder to a delayed email message to send the most recent file/folder version; - Delayed email messages will be sent automatically; - Use Send to send email messages from mailto links; - Send a delayed group message as a single email to all recipients; - A group message sent personally to a single recipient; - Split large recipient lists into smaller groups. SendLater examples of use: - No more reminders needed. Schedule repetitive emails at comprehensive intervals. - Direct marketing letters and reports - Routine company meetings follow-up reminders - Never miss birthdays or other events. This site does not contain serial number, crack, keygen SendLater for Outlook serial number : serial number is the simplest type of crack. A serial number(cdkey,product key,etc) is register the program as you may already know. a crack or keygen may contain harmful software. If you cannot find the exact version you want, just give it a try. for more information read .nfo/.txt/.diz file include in zipped file.